Don’t forget to love thyself! 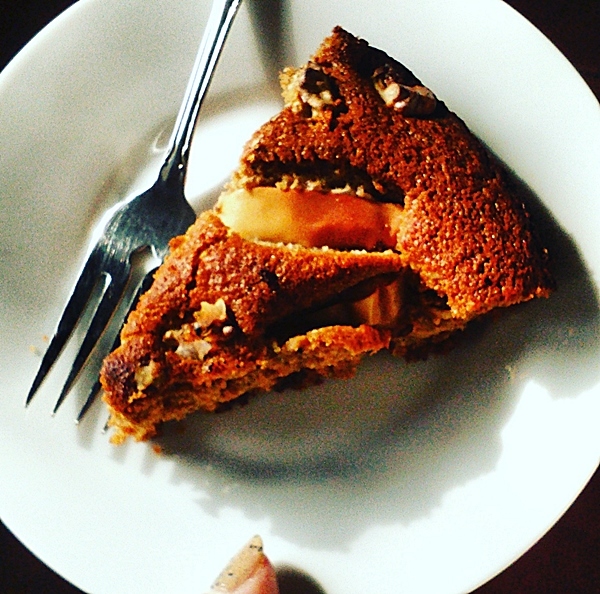 Apple and walnut cake – inspired by Madeleine Shaw’s Pear and Hazelnut cake. Institutionalized traditions, holidays and „Day of the (and substitute here just about anything)” make me think. Valentines day is no different. Should I express my love for the one on this day only? Why should this day be any different then the next? If that someone is special, I will choose to tell them I love them any day and every day! Of course the ones to testify to my success will be Mr. AP, my family and friends. But as I was thinking about Valentines day something slowly sank in: actually the one to whom I most often forget to tell that I love her – or take care of – is myself! Now, don’t get me wrong, I don’t mean this in a narcissistic sort of way. What I mean is, with all the rush in our lives – day jobs, team events, family, friends, obligatory social events, joint hobbies, and the list goes on… – I find myself with a virtual clipboard ticking off to-dos and not a moment to really take care of, pamper myself. You know, just pause, reflect and gather energy. To cater to my body, mind and soul. And that is sort of what prompted this hiatus from the blog. One of my resolutions was to slow down a bit. I started feeling the sort of pressure to perform and to finish projects for the blog just like in my job. And that sort of became scary. Scary, because my intention with the blog is to have fun and to make a diary of the fun I’m having. And not, definitely not have a second job on the side. Well as things go, with the little vacation and the minuses came the flu, the weakness, the coughing and the sleepless nights. Fitness plans gone haywire. Not my ideal start to the year! But then I realized, you know what? I’m going to give in! I am not going to focus on the negative, rather I’ll take the horny beast and tame him bit by bit. First up, my health. So I opened my beautiful Madeleine Shaw cookbook and today I made myself a Pear and Hazelnut cake (cough.. from apples and walnut). What better way to say thank you and express my love for my body than taking a new and healthy approach with my meals!? And I’ll take Valentines day as a reminder, that the most important person in my life is here and needs the LOVE.